Owners of multilingual websites may have already noticed a new International SEO report for our Site Audit tool. It was in open beta while we were working hard to develop new checks for this report and adding them one by one. Now the time has come and we’re ready to say that our work is done. Meet SEMrush’s International SEO report, which was designed to give you complete information about all possible hreflang implementation issues on your site. The International SEO report is located in a separate tab in the Site Audit tool, and it will be displayed only if you have a hreflang attribute on at least one page. If you still haven't set up the Site Audit tool, you can do it in no time. In the first section you can see a ‘Hreflang implementation’ chart, which shows hreflang usage statistics for your site. 11 hreflang checks are grouped in three categories in the Errors section. We consider these issues to be the most severe. This check comes in handy when a language value specified in a hreflang attribute doesn't match your page's language, which is determined based on semantic analysis. Such mismatches may confuse search engines, and your hreflang attributes will most likely be interpreted incorrectly. As the name suggests, this check shows a list of your site’s pages with no hreflang attributes. 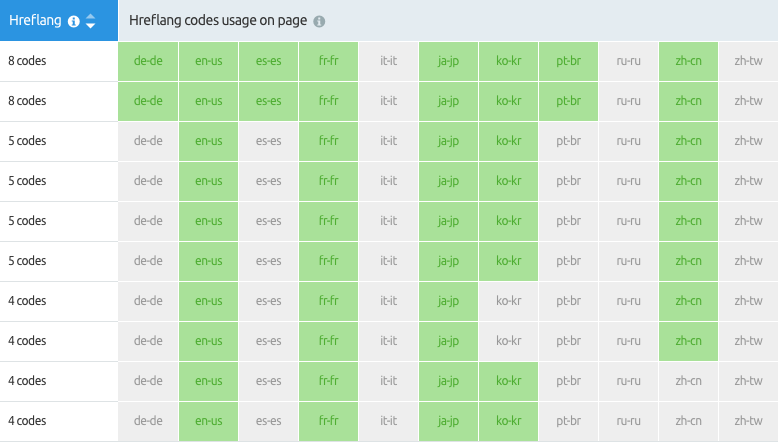 Also, in this section you can see a chart of hreflang code usage on a given page. Values in green are present in hreflang attributes listed on the page. Values in gray are not present in hreflang attributes. This check can help you detect pages with potentially missing hreflangs at a glance. Everything you need to successfully run a multinational site is now available in one place. Rest assured, your users will always land on the correct language version of your website. Stay tuned - more updates are coming soon!